The China train travel tips are listed to help you have a smooth China train trip, including how to choose a suitable train and seat class, when to buy a ticket, what to bring for a China train travel and other useful guide on food and toilet issues. Firstly choose high speed trains, then overnight sleeper trains. High speed trains or bullet trains are fast, comfortable and modern and they are mostly cheaper than flights. Traditional style overnight trains departing in the evening and arriving in next morning are also good choices, because they save the daytime and one-night accommodation cost. Remember to book a sleeper for a good rest. The middle bunk of a hard sleeper and the upper bunk of a soft sleeper are recommended, as the lower bunk are always used as seats by other passengers in day and the space between the upper bunk and the ceiling is too small. Avoid train travel in China during holidays. During Chinese holidays, especially Chinese New Year and National Day holiday, the China rail system always serves more passengers who are traveling or going home from working places or universities. Long queues in ticket offices, waiting halls, even the washing rooms inside the railway stations are common during these peak travel periods. Book the ticket once your travel is planned. China train tickets can be sold out within minutes of becoming available, especially for hot routes and during peak travel seasons. 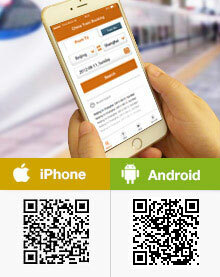 The tickets are put on sale 30 days prior to departure online or by phone, and 28 days prior at railway stations. The prices in general do not fluctuate. TravelChinaGuide accepts your orders in spite of the pre-sale period. Just make the order and we will handle the rest for you. Reach the departure station at least an hour earlier. If it is a holiday, make it at least 1.5 hours earlier. Boarding usually starts 30 minutes before departure at origin stations and 15 minutes at intermediate stations. One should be prepared for the queues at the entrance for ticket and security check, and also leave some time to find the right waiting hall and boarding gate inside the station. For those who are going to pick up paper ticket before departure, remember to spare another 15 minutes on usual days and 30 minutes during holidays. There are dining carts and dining carriages selling food, snacks, fruits and various drinkings, but the price is usually marked higher than outside. Bring some bottled water or a cup. The tap water is undrinkable, but there are water boilers where passengers can fetch hot drinkable water. Disposable cups are provided on high speed trains, but not on normal ones. So a cup is necessary when traveling by train in China. Better pack a scroll of toilet paper. Toilets are at two ends of each carriage. Toilets on high speed trains are usually western style. Toilet paper and hand cleaner are provided, but they can be used up soon after setting off. It is advisable to bring some of your own. The ones on an ordinary train are mostly squat type and toilet paper and hand lotion are not provided at all. If traveling overnight by normal trains for a long-distance journey, washing supplies like a towel and tooth brush, and your own entertainment like a book or a movie are also recommended on your packing list. Recharge the cellphone beforehand or take a portable power bank if by normal train. There are only a few electricity charging sockets on traditional style trains. A portable power bank will help you keep in touch along the way and you can kill time by watching a movie or listening to music. My experience was very positive. You were very prompt in getting back to me with questions you had regarding what I wanted and responding to my questions. Overall I would would recommend your services to any one I know coming to China. The train was very good. Unfortuneatly the weather wasn't perfect during the trip. The trains were comfortable enough for the 4 hour journey. Thank you for making this part of our visit a positive one. Incredibly easy and efficient service to use. We opted in for business class tickets (worth the extra money) and also had the tickets delivered to our hotel. Prior to arriving we were kept up to date with our tickets and upon checking into the hotel, we were given our physical tickets making the day of travel much easier. I highly recommend anyone traveling through China to use this service. The services that your representatives are excellent. Will use you service again in near future. Actually, I have already made recommendations to my Chinese Friends about your company web page. The G16 from Shanghai back to Beijing is excellent seat. Thank you again. Thank you so much for your travel service. It was handled professionally and promptly.. I really have no complaints. I would certainly use this service again! Everything is positive, it works fantastically and the trains are perfect. I wish they would be as god in my country, the Netherlands. We collected all the tickets in Harbin west which is a modern railway station and the service was very good. I had one bad experience, that was railwaystation Pingyao. As we did not use our tickets from Xinzhou to Pingyao, I tried to have them refunded in Pingyao. There was nobody at the? informationdesk and the ticketboots could not help us. So we did not have the tickets refunded. Thank you for the note. The booking was easy and the service provided was excellent. The tickets were mailed to our hotel on time and the train services were very good. Only the toilets on board can use some better cleaning and maintenance. First of all, I would like to congratulate your team for being very supportive when I asked about the train in China. Although I booked all the tickets in last minute time, but you and your team managed to issue the ticket for me. It was a bit difficult for me to collect the ticket in Beijing Railway Station since it quite big area and I did not understand Mandarin. I would love if there are special counter for foreigners to collect their tickets. Trust me they are all will be happy if you can provide such line. My all journey from Beijing to Zhengzhou and from Zhengzhou to Guangzhou was very fantastic. Even I was only at 2nd class seat but it was comfortable for tourist who are on budget to visit China. Never thought that thru out the journey, the scenery was so beautiful. I will never forget this experience. Since I am Muslim, it is quit hard for me to find halal food on the train. But , I was really happy when I saw there was a pack of Koh Kae peanut that showed halal logo . Thank You for provide such food on the train. I hope , in future, it will be variety of halal food on the train. I am from the UK and I was worried that I would not be able to understand the China train service. But I found the experience excellent. It was very efficient, very clean and very on time. The booking system was very good, even though I booked from the UK. The waiting rooms were very good. I would use your train service again in the future. Thank you. My wife and I booked the returned train tickets between Xiamen and Chaosan from the Travel China Guide (TCG). The procedure was easy, and the follow-up and reminder by TCG staff were more than prompt. We collected our returned tickets with our passports at the train station 1.5 hours before the departure time. It was a breeze, very easy. Check-in was easy too, no rush. Storage area at one end of each carriage was big enough to keep our two suit cases of 28"and 24". The seats and ride were comfortable. Your services were good. The tickets have been in the hotel when we arrived. We can recommend your services. I have booked a train from guangzhou south station to Kowloon west. May I know what are the documents required for immigration. Where does the immigration takes place? Before boarding the train or after i landing in Kowloon. It would be at West Kowloon after your arrival. Your Chinese visa to out China mainland will be checked the also visa to enter HK (if you need one). I was on a train in China, and some man in white was checking the tickets. I gave him mine and he went away. A few minutes later, another man came and started talking to me in Chinese. I said I didnâ€™t understand. I finally understood that he wanted my passport. So he wrote some stuff down and he wrote my passport number. Why did he do this? I was the only one they did it to and was the only â€œwhiteâ€ person on the train. My friend, who looks Chinese, has NEVER had this happen before. It is hard to know. Maybe just some routine inspection, sometime Chinese travellers are also be requested to show ID card. I don't find available hard sleeper tickets in my station, but there are hard sleeper tickets available from the origin station of the ride. Can I buy tickets for hard sleeper from the origin station but get on at mid journey? Will I have problems to enter my station with the ticket? e.g. : from city A to city C there are hard sleeper tickets, but from city B to C there aren't (the ride does the journey A-B-C). Can I buy the tickets from A to C and get in in the city B? Yes, this can work but it is important that you need to get the paper ticket in hand before the departure time from city A. Otherwise the railway system may consider that you missed it and the bed may sold to other people. If you have the paper ticket in hand before the departure time from A, they will know that there is a chance you may get on from the halfway and your bed will be hold for you. Can I book two tickets in case I miss the first train? Next week I will be landing in Shanghai (PVG Int. Airport) at 6:45pm and will be going to Suzhou straight away. I want to take the 9:50pm one as I have to be up early the next morning, however I am worried I might miss this one by the time I get to the station and line-up for the ticket. Is it possible for me to book a second ticket now for a later time (say 11:30ish) so that I have the back up ticket in case I miss the 9:50pm ride? Will the ticket office have an issue if they see two tickets booked next to my name/passport? This is OK as long as the time for both tickets are not conflict with each other, which means the departure time for your second ticket should be later than the arrival time of your first ticket. But in this way, it means one of the ticket will be wasted and no refund at all unless you catch the first one and have enough time to refund the second one at the station before its departure time. Thank you very much for your insight. I will make sure that the tickets don't clash.